Drums kits available to order from several first class boutique drum-making companies. Just ask. The following are currently in stock and available for demoing at our showroom in Riihimäki. The prices include VAT 24% and free delivery within Southern Finland. Elsewhere, please ask for a shipping quote. And yes, we ship internationally. In February 21st 1969 the world of drumming bid farewell to one of its most iconic and prolific product designers ever: George Harrison Way. 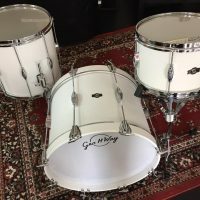 After his death the company remained dormant until 2006 when independent drum and percussion product designer Ronn Dunnett acquired the rights to the GHW and George Way Drum Company and shortly thereafter began work restoring the company and maintaining the Way legacy. In the years since that work began Dunnett and the George Way Drum Company stand as the only heritage brand to mount a successful relaunch. 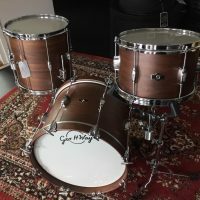 Ronn Dunnett’s work in rebuilding the company and maintaining and expanding on George Way’s innovations and dedication to quality and customer service mean that drummers are able to own and experience a genuine vintage look and sound combined seamlessly with modern manufacturing. 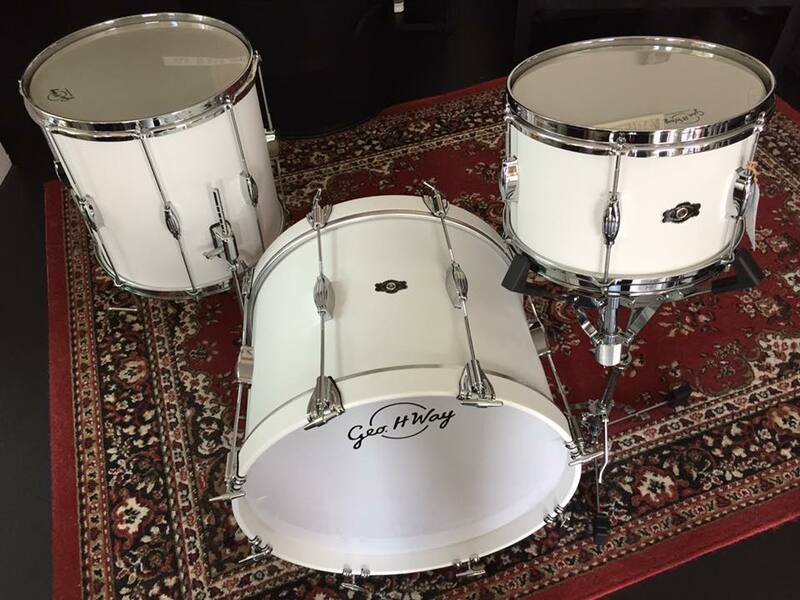 All George H. Way “Tuxedo” kits are offered with only traditional sized drums. Bass drums available from 18″ to 26″ and toms from 10″ to 18″. Shell materials and available finishes vary from production batch to another – in 2017 the materials are walnut (in natural walnut or matte white), mahogany (in natural matte or wide red gloss lacquer), and walnut/cordia (in matte lacquer). More George Way kits arriving later this spring. The bee’s knees in modern vintage. 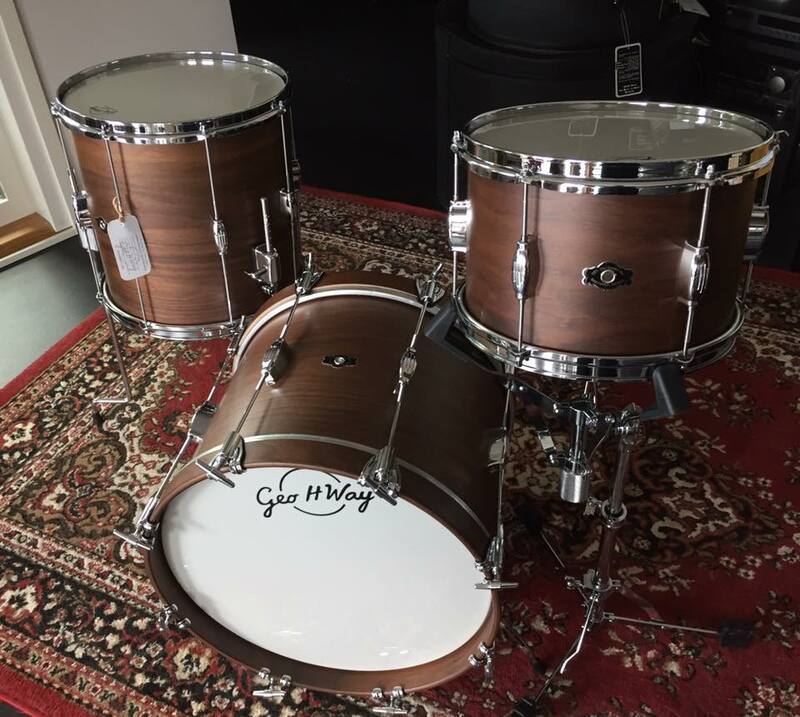 4-ply walnut shells with 4-ply, electronic bonded reinforcement rings. This kit comes with a 14×18″ bass drum, 14×14″ floor tom, and 8×12″ tom. The bee’s knees in modern vintage. 4-ply walnut shells with 4-ply, electronic bonded reinforcement rings. This kit comes with a 14×20″ bass drum, 14×14″ floor tom, and 8×12″ tom.